Visiting schools is the best CPD you can have. The chance to meet teachers, talk to students, senior management, watch, listen and absorb has been the best part of this trip so far. Our visits today were to schools I know from Twitter as both Vicki (Assistant principal at Doveton) and Peter C (music teacher at Timbarra) have got involved in some of the online chat about Musical Futures – putting names to Twitter personalities was great and seeing their contexts helped put some of the things we had heard from them into perspective. 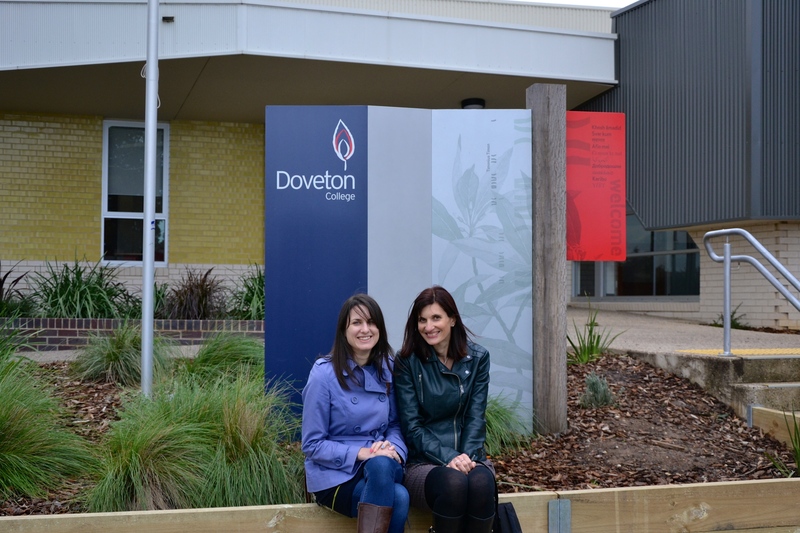 Doveton is a school with a shifting population and high numbers of children from families of immigrants many of them coming from troubled countries where they may have experienced violence or trauma. The school opened after 4 others in the area closed so 3 years in, some of the older students have had a lot of change in their education. The school addresses some of its social issues by placing itself at the centre of the community, getting involved with local residents, offering pre natal care and then seeing the children all the way through school. Enquiry based learning is used across the school and although it’s early days what stood out was the quality of the IT students had access to – macs and professional level software and associated hardware was available to all. Again more than one adult in the room to support students meant the lessons we saw were calm and students were engaged and again these adults have worked or continue to work in the industry they are teaching students about. The music department currently has year 7 for one semester and year 8 for the second, year 9 have music once a week. Lessons are 2 hours long although next year they will move to an hour a week for everyone. The Head of Music, Peter Wardrobe described how some of the more challenging kids in the school show far better behaviour in music and described his approach as, “every lesson is a conversation”, a statement I really like. We listened to music created and recorded by Y9 students. The quality was amazing. They played musically, had a complete understanding of the genre and performed with real expression and musicality. Peter is unapologetic that they learn through one genre of music-the one that the students themselves understand, engage with and are keen to learn more about. The second school we visited was Timbarra P-9. The teachers there, Peter and Julie have been incredible advocates for MF and visiting the department soon revealed why. In this school they had to build a case to put to their principal to justify investing in equipment and space to run MF. They did this by putting together a band who rehearsed with him at lunchtime, performed to the senior leadership, then to the School Council and used this (and the students’ passion for what they had been doing) to demonstrate what classroom music could look like if they invested some money to get it started. Fast forward and they have a new space, jam hubs and performance area and music in the school us vibrant and healthy. There is a clear vision for what the department would like to do next and given the passion and dedication of the teachers I have no doubt they will go from strength to strength! 1) Is it realistic to hope to achieve everything we try to in just an hour a week? At Doveton they are unashamed at their emphasis on just one style of music. But it’s child-centred across the school so the students choose and that’s OK. With just one focus, they can produce some incredible results in terms of outcomes and the learning journey they go on. The standard of some of the songwriting we heard was way above anything I’ve heard in my school and it was tinged with the influences of the backgrounds of the students. With a high immigrant population, exposed to music at home it’s natural that these influences are everywhere, in the songs they choose to play and those they compose. 2) In our departments, where do or should student choices start and finish? If it’s not about them them, their skills, talents, interests, passions, why are we doing it? Who says that ours are better then theirs? Obviously, I’ve had a huge range of musical experiences, I know a fair bit about quite a lot of music and I know it’s my responsibility to give my students the benefits of this and it’s my job to widen their experience of the huge wealth of music out there. However, music is about sharing and you never stop learning. Often love of music is spread socially-someone playing or talking about a piece, sharing their love for it that inspires another to go away and listen to it. I need to think far more about this, I don’t know the answer. 3) Is our ‘bitty’ music curriculum actually the right approach? Is a bit of blues, a bit of classical, a performance unit, a composition based on graphic scores, theory and notation, hooks and riffs, the instruments of the orchestra, 6 weeks of musical futures etc really right, will they actually be able to excel at any of these. I’m not too sure. Is there time and space to be able to do so much to a really high high standard? The quality of student music we heard today was outstanding and ALL of it had been done in class. Either (child centered): one syle/genre=amazing outcomes=great experience for students. Or (teacher driven): Range of genres=challenge to cover in the depth required=widening the range of music students are exposed to=less quality in the outcomes. Where’s the best learning in these? 4) the schools we saw today were P-9 – that’s our reception to our year 10. What a fantastic opportunity to explore the transfer of pedagogy across phases. At Timbarra, the MF approach has gradually gone further and further down the school. They use different instruments but the pedagogy remains the same. I think most of the issues in the UK around transition could be addressed if we could find some consistency at primary school. If all children had explored roughly the same things in the same way then our starting point at secondary would be a million miles higher. Could we go even further and ask that primary children have a consistent experience of HOW they learn music rather than perhaps them all studying the same unit or topics? Of course this would require an overhaul of training of our primary teachers in delivering musical music lessons which I feel could do so much to improve confidence amongst class teachers who probably don’t consider themselves to be music specialists. Tomorrow we visit Trafalgar, a primary school where Musical Futures with younger students has had some truly amazing outcomes. Can’t wait. Glad you got to see some of what happens with Musical Futures here in Australia. Every school is different, yet the philosophy remains essentially the same and although we have embraced contemporary/popular music genres, what the kids do with this differs greatly in every class and school. Engagement is high and from there learning inevitably follows. Happy kids = happy learners = more young musicians playing music, more often at school.